It was questionable judgment at best: a 10 hour slog up dreadful I-95; 9+ hours of walking and standing, then a 9 hour return trek to cap it all off. All in the name of restoring sanity, and/or fear, as only Jon Stewart and Colbert’s cronies can do. Surely there are saner ways of spending a weekend (lending moral support for my daughter’s college application deadline, boosting local get-out-the-vote efforts and cheering at Claire’s soccer game among them). But this was a once-in-a-lifetime opportunity, and I jumped at it. 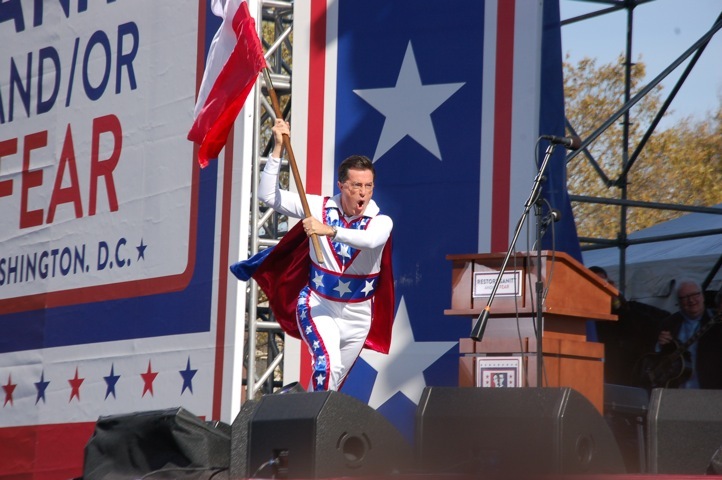 To be on the Washington mall with throngs of costumed, sign-waving, middle-aged, open-minded, like-minded, optimistic, fed-up, concerned, committed, creative, fun, passionate, funny, spunky, mildly insane people was just the kind of Saturday I needed. Meeting the legendary and genuinely kind Mavis Staples of the Staple Singers and posing with Tony Bennett was icing on the Halloween cupcake. The take home message from my political activism binge weekend was not that the Left is right (or sane), and the Glenn Beckers are all wrong, but that being with your peeps is comforting, and necessary. It is the teary, tingly feeling of gratitude and assurance that I felt last spring at the ALS walk, surrounded by my mother’s posse. It is the sense of grounding at-homeness I felt the weekend before last when old family friends who had known my dad as a young man, and me as a young girl, gathered to raise a glass in his memory. Being in DC, hanging out with 220,000 kindred souls from all over the country and all walks of life, to raise a sign and a song in memory and/or in dreams of better days, was wildly uplifting. The intrepid October sunshine cascading on the Capital’s rotunda — the Rally’s inspiring backdrop — didn’t hurt either. Where two or more are gathered, the good Lord says, is where the holy becomes amplified. 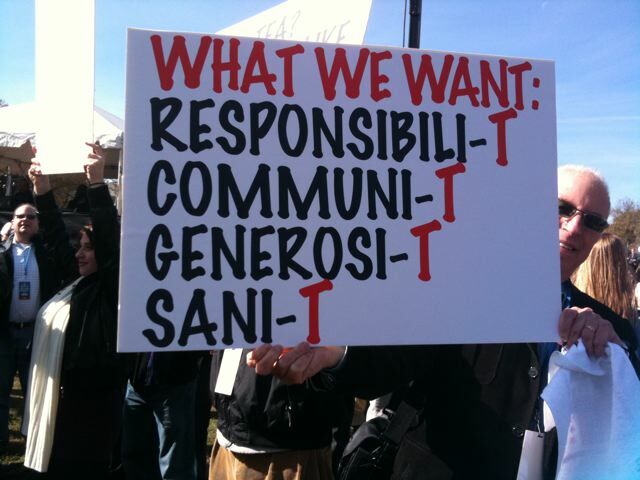 Perhaps a humble blog might count, too, as an offering of common ground, of shared sanity, of sacred presence. We’ll call it our small, quiet rally. Who knows, maybe Stephen, or Tony, will show up? ~ by Stephanie on 11/03/2010. Oh how I needed this post tonight. 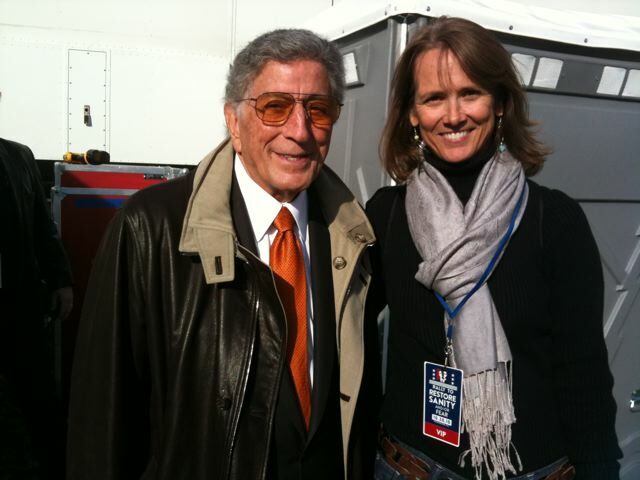 You look MAHVELOUS with Tony Bennett, Stephanie! I saw him once, on his way to the restroom in an LA restaurant, and I remember thinking that he looked so much like himself! I’m glad that you had such fun with your peeps. I wish that I’d been there! Is that a scenic port-a-let behind you and Tony? Perfect. I feel the rev and energy of the day just reading about your romp through it. Congratulations on your lax sanity, allowing you this insanely good feeling of being at home with 220,000 others. You inspire me, woman!